Searching for a makeup professional in Ahmedabad to give you the best wedding makeup? No need to look further when UrbanClap is here. We bring to you services of our best wedding makeup artists in Ahmedabad to get you the best wedding makeup look. The bridal makeup package includes HD makeup, airbrush makeup and branded cosmetics. Since we have the best bridal makeup artists in Ahmedabad with us, we assure you the best. Amazing service. Booked for my niece and excellent reception makeup done. I was surprises by the work! Super amazing work! They use original brands and in a afforable range.. moreover the makeup lasts for olmst 8 hrs! M super haapie! AJ. U made my day! Amazing MUA. Very sweet and understanding. She did excellent Work.very nice and polite. She knows how to get things done.punctual, professional. Highly recommend.thank you. Definitely a great make up artist. She made my day on my big day!! I would recommend her for sure. She was amazing.. she knows what's trending and super easy to work with... Definitely looking for future collabs with her..
Go through their portfolios comprehensively: You can find several professional makeup artists in the city who have put up their personal works on websites or on other social media channels. Ask their portfolios for a better idea of the artists’ style preferences on makeup looks. The most essential thing to check is the range of makeup looks they can create on a bride. You can assess if the makeup artist is able to work with different types of skin colours and skin types. As a good MUA who has a variety in her/his works, he/she knows how to create makeup looks according to the client’s style preferences. You can get a personalised bridal makeup look. If the makeup artist provides the same look on all brides when you check their portfolios, do not hire him/her for your wedding. If they have other bookings on your wedding functions: If the makeup artist is booked with other appointments but would also be able to make it for the functions, ensure that the MUA does not rush through the bridal makeup. Make sure that there is ample time to travel between the appointments while keeping into consideration the unanticipated delays. I’ve Found 2-3 Bridal Makeup Artists in Ahmedabad that I Like. How Do I Finalise One? 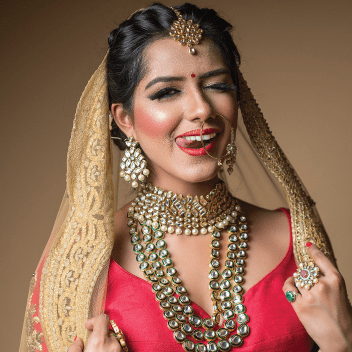 After finding a few bridal makeup artists to your liking, firstly call them to enquire if they are unoccupied during your wedding functions such as the wedding, reception, mehndi and sangeet. Enquire about the brands and the makeup products that the artists professionally use. There are three main makeup types – traditional, HD and airbrush. While traditional and HD are makeup products, airbrushing is a makeup application technique. Traditional makeup has been most commonly applied on brides for decades. Expert makeup artists always use traditional makeup products that are professional and standard. Any makeup method such as sponge, brush or fingers can be utilised and for almost any occasion. This is why traditional makeup is versatile. Traditional makeup products give a look between sheer and heavy coverage. Most traditional makeup products are not waterproof. A professional MUA can always create a good makeup look with traditional makeup application, even though there are different types of makeup products available. However, a traditional makeup can look cakey when applied on problematic skin. The MUA needs to put more makeup on the uneven areas, which can look patchy through cameras. HD makeup has ingredients to give a perfect finish without revealing any flaw of an uneven skin when seen through high definition cameras. HD makeup offers more translucence and has a liquid texture, in comparison to traditional makeup products. When applied, it provides maximum coverage and gives a natural look in photographs. This technique involves a spray gun for the makeup application. Instead of a cakey makeup look, this technique creates a fine mist where the genuine colour of the skin appears. The finish is almost skin-like. It is waterproof but you should not wipe away the tears and sweat. Just dab them. One of the biggest advantages of the airbrush technique is that when the foundation is sprayed out of the spray gun, it oxidises with the air and you will see the actual colour of the foundation within seconds. The foundation’s colour shows up after 15 to 20 minutes with other makeup application methods. The MUA is able to control the amount of makeup to be applied on the difficult areas of the skin and can move in and out of irregular areas effortlessly. This is why it is an accurate method for applying makeup. Moreover, the makeup look with this method has a sheer and the uneven parts of the face look better under cameras. After application, the makeup looks properly mixed. 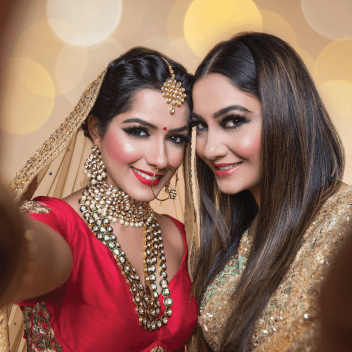 The cost of makeup for the wedding day is higher than the costs of the other functions such as mehndi, sangeet and reception etc. Hiring just one makeup artist for all the functions would be advantageous as there would be a reduced rate on the total price. If the makeup artist has to travel to another city to provide bridal makeup services, the bride is required to pay for the travel as well as the accommodation. Ideally, there should be a trial session before a month of the wedding. The trial session is beneficial as you can judge the makeup artist’s work and also ask her to make changes if the makeup look didn’t turn up the way you had expected. You should not hire a makeup artist if she/he is not revealing the list of services and their prices, or is unwilling to take a makeup trial with you. Mostly you have to pay for a bridal makeup trial session and this payment can be later adjusted with the final payment if you are hiring just one MUA for your wedding functions as well. Full-face trial: Although it would not be done perfectly, the makeup will give you a basic idea on how you will look with the makeup. Full-face trials cost Rs. 1,500. Half-face trial: The makeup is put on just one side of the face so that you can check and compare it your general look. On the other hand, the MUA could show you how two different makeups would look with airbrush makeup application on one side and traditional makeup on the other side. The MUA can also put two different eye makeups on each eye and you can choose the one you like best. Speak openly with the makeup artist and show her some reference photos of the style you have chosen. It will be better if you can show her the photos of the wedding dresses that have been finalised. This will allow the MUA to create a makeup look that will match the dresses. You should discuss about how the products will complement your skin type and also about eyelash and hair extensions. When the trial session starts, notice what she does and listen properly to everything she says. A relative or a close friend can always go to the MUA’s city to take the trial session instead of you. But, do remember to share exhaustive notes on what you would want from the makeup artist. After the end of the trial session, take a video call and speak about the essentials of how you would want the makeup to look like on you. It is essential that the MUA knows what makeup should be applied to different skin types. For instance, for a bride whose skin is oily, a mattifying foundation would be required. After the makeup is applied, there should be no rough lines visible as the foundation, contour, blush and eye makeup must blend without effort. The base has to look natural. You should click photos of you in makeup in natural and artificial lights and see if the colour of the foundation is matching the colour of your skin. You should also check if the acne marks and blemishes have been covered and see if the dark circles have been appropriately reduced as covering dark circles completely can look strange and unnatural. Do take into account on how long the makeup will last. 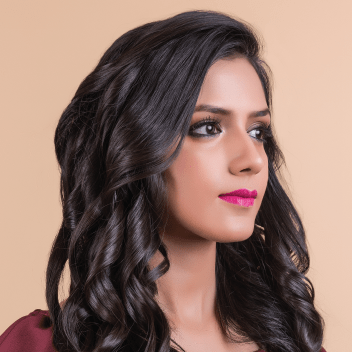 Pose pertinent questions: After connecting with makeup artists in Ahmedabad, ask them what products they professionally use and how they would complement your skin type. Then you should ask about the regular rates to get a basic idea on how much you would have to spend on makeup services for your wedding. A low rate should not be a determining factor to book a makeup artist. You should ask what products they use and how they maintain a good quality if some makeup artists are offering bridal makeup services at cheap rates. What you should look for is a balance between quality and the cost. Ask them how they follow hygiene: Check whether the MUA uses only brushes that are clean, makeup sponges that are properly washed, disposable mascara wands, mixing palette for makeup products and whether she/he regularly sanitises the makeup products. A professional makeup artist always follows good hygiene by keeping products in germ-free conditions and also has a good idea where every makeup product is placed in the makeup kit. If a makeup artist keeps an unorganised makeup kit and does not use clean brushes but is providing a makeup service at a low cost, you should not hire the MUA. Share your style choice and see how they react: The MUA must pay close attention to how you want the makeup to be, either simple or bold. You should show the MUA some photos from where you got the inspiration to go for a particular makeup look. The makeup artist can then bring up her ideas so that you get the makeup look you were looking for. Any good MUA is always paying attention to what her clients prefer. If the MUA is inattentive to your request and coercing her ideas on you, don’t hire her for the wedding. Make a query on when and how much amount as advance you have to pay along with the cancellation policy and the mode of payment. Do ask your MUA if she would be getting along some others for your appointment so that you can make sure how much space would be required. Booking just one makeup artist for every function of the wedding will be favourable, as you would get a bulk discount. You can also request for any changes in the makeup that you may want later. For instance, if during the sangeet function, your eye makeup was too deep, you can openly ask the MUA to reduce the amount for the succeeding functions. Since the bridal makeup artist would be more focused on you, hire a separate MUA who can apply makeup and drape sarees on your relatives and friends. You can also ask your MUA to bring other makeup artists with her for your wedding as part of the team. Makeup must never be applied immediately after a facial. Preferably, a facial must be done 48 hours before the first function. After waxing or threading, makeup should be applied 24 hours before the function, as the skin’s redness must settle down.